After installing HPe iLO Amplifier on your network and updating iLO 4 firmware to 2.60 or 2.61, you may notice that your HPe Proliant Servers may fail to boot ESXi from a USB drive or SD-Card. This was occuring on 2 ESXi Hosts. Both were HPe Proliant DL360p Gen8 Servers. 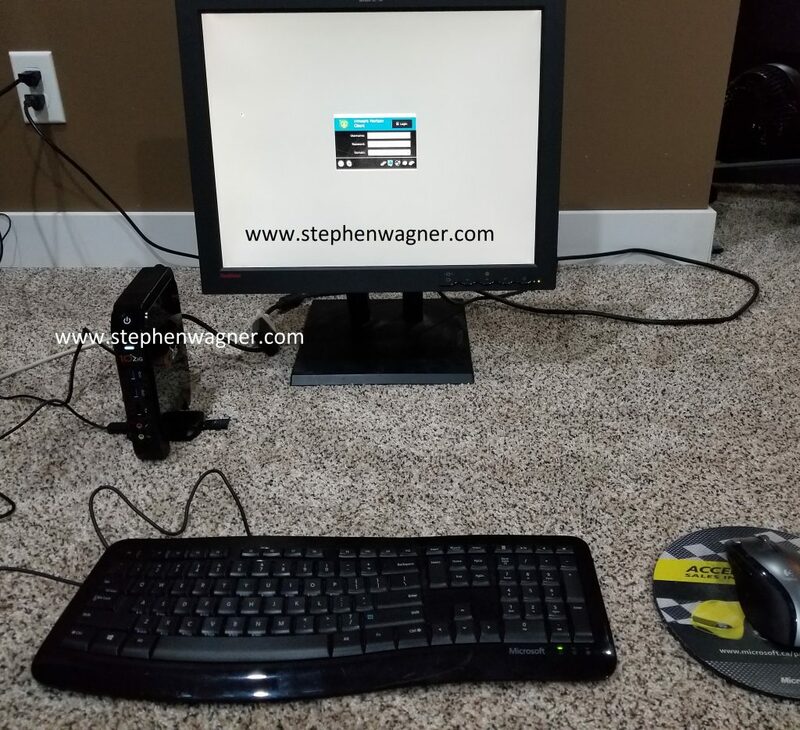 One server was using an internal USB drive for ESXi, while the other was using an HPe branded SD Card. The issue started occuring on both hosts after a planned InfoSight implementation. Both hosts iLO controllers firmware were upgraded to 2.61, iLO Amplifier was deployed (and the servers added), and the amplifier was connected to an HPe InfoSight account. This issue may occur intermittently, on the majority of boots, or on all boots. 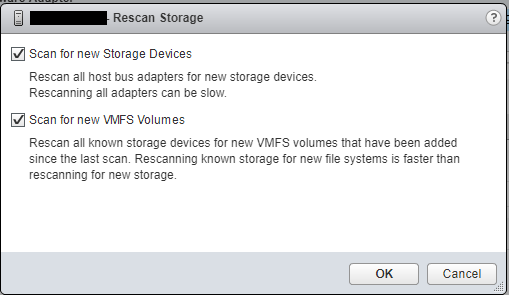 Re-installing ESXi on the media, as well as replacing the USB/SD Card has no effect. Installation will be successful, however you the issue is still experiences on boot. HPe technical support was unable to determine the root of the issue. We found the source of the issue and reported it to HPe technical support and are waiting for an update. 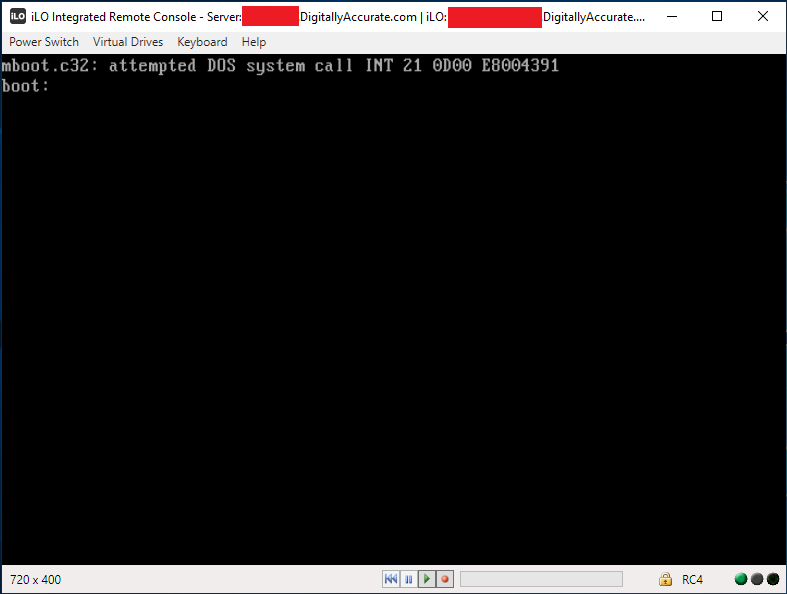 This issue occurs because the HPe iLO Amplifier is running continuous server inventory scans while the hosts are booting. When one inventory completes, it restarts another scan. Inventory scan resets back to 0% during numerous different phases of BIOS initialization and POST. We noticed that once the HPe iLO Amplifier Virtual Machine was powered off, not only did the servers boot faster, but they also booted 100% succesfully each time. Powering on the iLO Amplifier would cause the ESXi hosts to fail to boot once again. 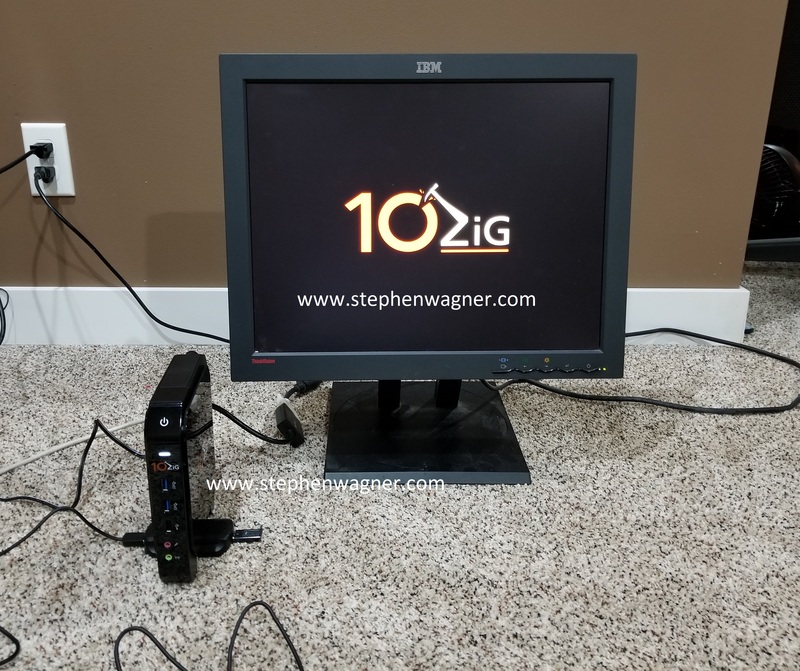 I’d also like to note that on the host using the SD-Card, the failed boot would actually completely lock up iLO, and would require physical intervention to disconnect and reconnect the power to the server. We were unable to restart the server once it froze (this did not happen to the host using the USB drive). There are some settings on the HPe iLO amplifier to control performance and intervals of inventory scans, however we noticed that modifying these settings did not alter or stop the issue, and had no effect. Make sure your iLO amplifier is powered off during any maintenance to avoid hosts freezing/failing to boot. I’ve attempted to try downgrading to the earliest supported iLo version 2.54, and the issue still occurs. I also upgraded to the newest version 2.62 which presented some new issues. On the first boot, the BIOS reported memory access issues on Processor 1 socket 1, then another error reporting memory access issues on Processor 1 socket 4. I disconnected the power cables, reconnected, and restarted the server. This boot, the server didn’t even detect the bootable USB stick. Again, after shutting down the iLo Amplifier, the server booted properly and the issue disappeared. Did you know that you can monitor and manage your VMware vSphere environment (ESXi hosts, cluster, and VMs) remotely with the “VMware vSphere Mobile Watchlist” app on your Android phone? Well, you can! For some time now, I’ve been using this neat little app from VMware (available for download here) to monitor and manage my vSphere cluster remotely. You can use the app while directly on your LAN, or via VPN (I use it with OpenVPN to connect to my Sophos UTM). I’ve even used it while on airplanes using the on board in-flight WiFi. 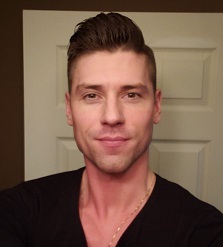 The reason why I’m posting about this, is because I’ve never actually heard anyone talk about the app (which I find strange), so I’m assuming others aren’t aware of it’s existence as well. The app runs extremely well on my Samsung S8+, Samsung S9+, and Samsung Tab E LTE tablet. I haven’t run in to any issues or app crashes. 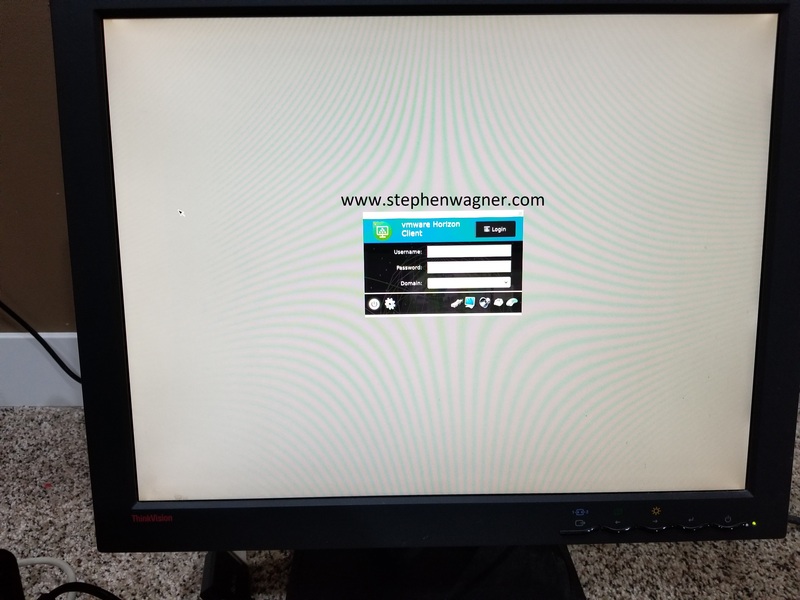 The above screen is where you initially log in. I use my Active Directory credentials (since I have my vCenter server integrated with AD). In the default view (shown above), you can view a brief summary of your ESXi hosts, as well as a list of virtual machines running. After selecting an ESXi host, you can view the hosts resources, details, related objects, as well as flip over to view host options. Under host options, you can Enter Maintenance mode, reboot the host, shutdown the host, disconnect the host, or view the hosts’ sensor data. Checking the HPe Proliant DL360p Gen8 fan sensor data with VMware Watchlist. Checking the HPe Proliant DL360p Gen8 temperature sensor data with VMware Watchlist. While not shown above, you can select individual items to pull the actual temperature values. Please Note that the temperature values are missing a decimal (Example: 2100 = 21.00 Celsius). 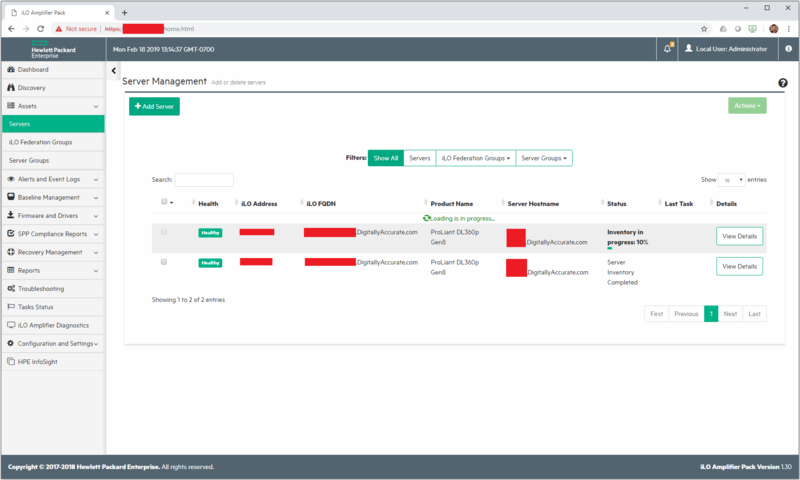 When selecting a VM (Virtual Machine) from the default view, you can view the VM’s Resources (CPU, Memory, and Storage), Details (IP Addresses, DNS hostnames, Guest OS, VMWare Tools Status), related objects, and a list of other VMs running on the same host. Flipping over to the VM options, we have the ability to power off, suspend, reset, shutdown, or gracefully restart the VM. We also have some snapshot functionality to take a snapshot, or manage VM snapshots. In my environment I have two HPe DL360p Gen8 Servers and the sensor data is fully supported (I used the HPe custom ESXi install image which includes host drivers). Running Veeam Backup and Replication, a Microsoft Windows Server Domain Controller may boot in to safe mode and directory services restore mode. About a week ago, I loaded up Veeam Backup and Replication in to my test environment. 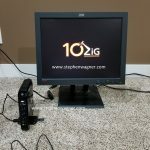 It’s a fantastic product, and it’s working great, however today I had a little bit of an issue with a DC running Windows Server 2016 Server Core. I woke up to a notification that the backup failed due to a VSS snapshot issue. Now I know that VSS can be a little picky at times, so I decided to restart the guest VM. Upon restarting, she came back up, was pingable, and appeared to be running fine, however the backup kept failing with new errors, the event log was looking very strange on the server, and numerous services that were set to automatic were not starting up. This specific server was installed using Server Core mode, so it has no GUI and is administered via command prompt over RDP, or via remote management utilities. 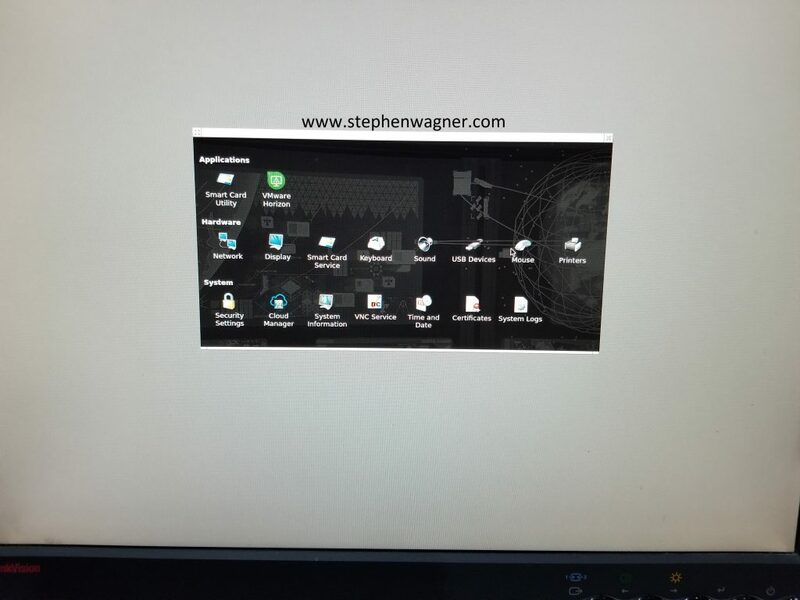 Once RDP’ing in to the server, I noticed the “Safe Mode” branding on each corner of the display, this was very odd. I restarted the server again, this time manually trying to start Active Directory Services manually via services.msc. 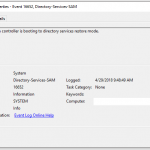 General Description: The domain controller is booting to directory services restore mode. The domain controller is booting to directory services restore mode. 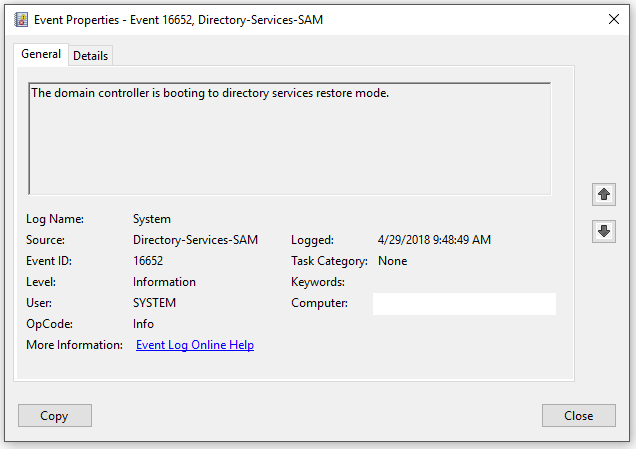 To my relief, I read numerous sites that advise that when an active backup is running on a guest VM which is a domain controller, Veeam activates directory services restore mode temporarily, so in the event of a restore, it will boot to this mode automatically. In my case, the switch was not changed back during the backup failure. Restart the server and the issue should be resolved! With the news of VMware vSphere 6.7 being released today, a lot of you are looking for the download links for the 6.7 download (including vSphere 6.7, ESXi 6.7, etc…). I couldn’t find it myself, but after doing some scouring through alternative URLs, I came across the link. Unfortunately the page is blank at the moment, however you can bet the download and product listing will be added shortly! UPDATE 10:15AM MST: The Download link is now live! More information on the release of vSphere 6.7 can be found here, here, here, here, here, and here. I went to re-deploy some vDP appliances today and noticed a newer version was made available a few months ago (vSphere Data Protection 6.1.5). After downloading the vSphereDataProtection-6.1.5.ova file, I went to deploy it to my vSphere cluster and it failed due to an invalid certificate and a message reading “The OVF package is signed with an invalid certificate”. 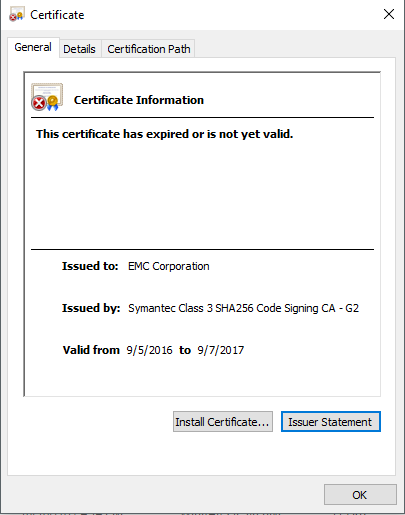 I went ahead and downloaded the certificate to see what was wrong with it. While the publisher was valid, the certificate was only valid from September 5th, 2016 to September 7th, 2017, and today was October 27th, 2017. It looks like the guys at VMware should have generated a new cert before releasing it. Once you download and install this, the executable can be found in your Program Files\VMware\VMware OVF Tool folder. This command will repackage and remove the certificate from the OVA and save it as the new file named vdpgood.ova above. 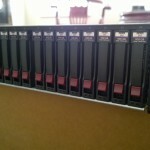 Afterwards deploy it to your vSphere environment and all should be working!